Portable Charger Romoss Sailing 3 (7800 mAh) - it is an external battery with a large enough capacity (under normal conditions can charge iPhone4 about 5 times) that allows you to communicate more, take pictures and videos, read, share information with your friends listen to your favorite music no matter whether there is a nearby outlet. 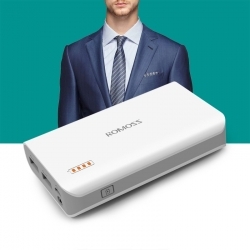 It has 2 USB output and can charge two devices simultaneously. Have the ability to quickly charge your tablet through port 2.1 A.